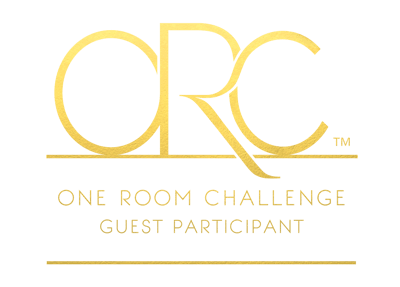 It’s the fifth week of the One Room Challenge! Wahhooo. And here we are at week 5: I’m focusing mostly on furniture and wall art this week. I’m not putting much up in this space…only two things. Earlier this week I shared the full DIY tutorial for my abstract gold leaf canvas art, which I love in this space! And that’s it for the walls! The space has so many windows that there isn’t really room for much else without it feeling too cramped. I thought about putting something on the smaller black wall that’s adjacent to the wall Templeton and Ophelia are on, but I ultimately decided that I wanted them to remain the focus. They are so cool. We used almost all furniture that we already had, and it’s all from Ikea because we’re fancy like that. 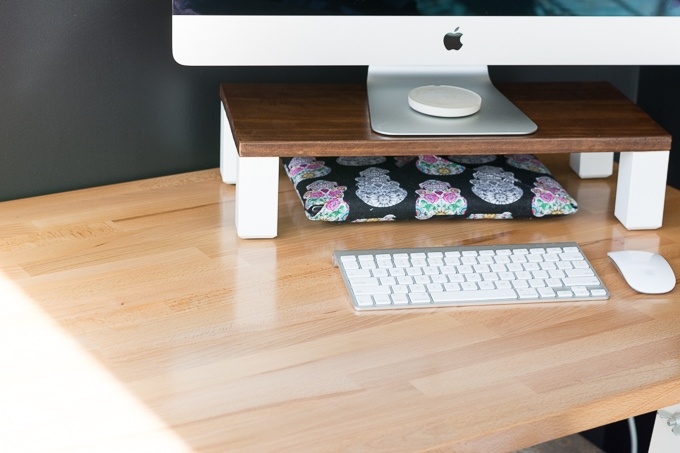 My desk top also needed some major TLC, so I refinished it with a semigloss polyurethane. 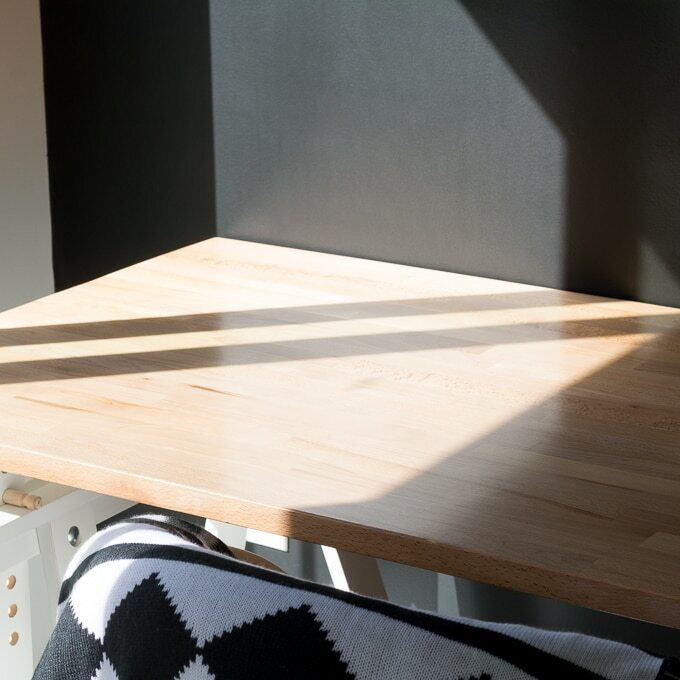 See that full how to post here, including tips on choosing between polyurethane and polycrylic to protect your furniture! This is a multi-use space that we’ve designated for both dining and my work space. My biggest concern was (and remains) the fact that most of the furniture is up against the walls, leaving the middle of the space a bit vacant. The room is really designed to be a dining room only, with a table in the center of the room under the light fixture. However, we don’t have a dining room table, and even if we did, it’d be super cramped with my desk in there. We also don’t have the room to designate an entire room to my work space. But that’s okay! We think we’ve found a way to fit it all in here without being too awkward. Maybe one day we’ll decide we want to get a real dining room table and have to reevaluate, but for now a bar top table suits our needs just fine. 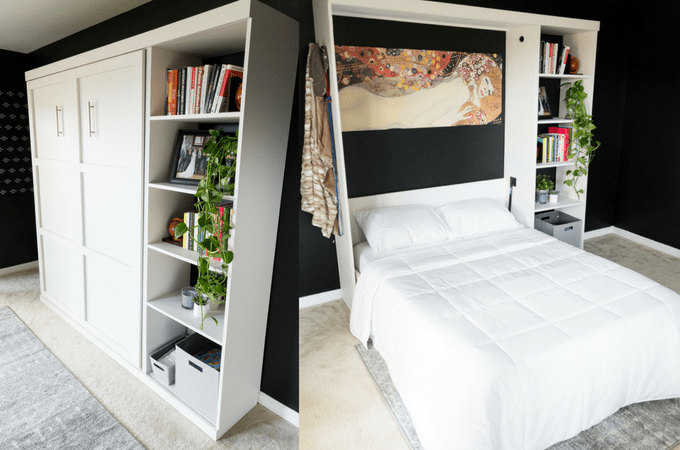 I’ve always loved the idea of dual-purpose rooms and working with small spaces, so we’re happy that we’ve been able to make the space work for our needs! Swing back next week for a final reveal of the entire space! I cannot WAIT to share everything! love how the deer look on that dark wall! Everything pretty much looks like your mood board and kudos to you! Can’t wait to see next week. That art piece is beautiful!! Love the gold leafing! So excited to see the space come together next week!! Thank you Lindi!! I also can’t wait to see your closet! 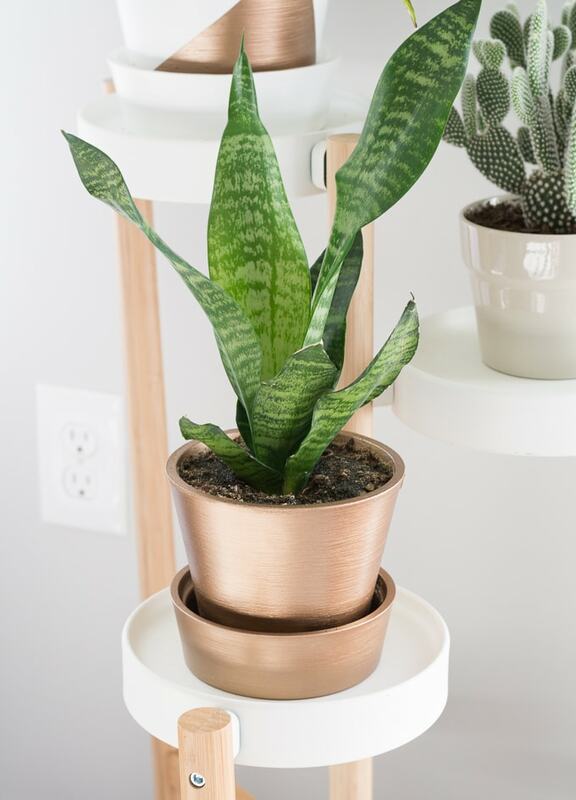 Love a plant-filled home, the deer are gonna love it too. Coming along nicely! I can’t believe I missed that gold leaf art print! I gotta go see that! Thanks! Just have to get the shade up on the sliding door and hope it’s a sunny weekend so I can shoot it!! I seriously can’t wait for your final reveal next week! I love all of your style choices! The gold leaf art is fantastic! And I love those deer! Thanks Emy, and it was so easy, too! That dark wall has my heart! It’s looking so good! The gold leaf art is amazing! The deer really pop against the dark wall. Can’t wait to see the full reveal next week! Thanks lady! I absolutely love the deer!! This is turning out so good! And that gold leaf art is unreal! Brittany, I love the white deer heads on your dark wall, They really stand out and pop, and I love their names, even if you didn’t name them! Less than a week to go! I know, I kept referring to them by name after I ordered them and was waiting for them to arrive. I have no shame! I love the look! The light airy curtains, the peaceful light gray, the bold dark gray! I am mad about animals in Decor as well and Love the Faux Deer! It’s just perfect! Thank you so much Jeannee!! I love the black and white contrast too! I have been seeing a lot of it lately, simple and modern! Good job, almost there! I’m loving the clean and chic look! The gold leaf art….amazing! The pop of white from the taxidermy on the black wall? brilliant! All the details are so pretty! I love that dark wall with the deer heads. I can’t wait to see the full reveal next week! I’m absolutely love everything about this space! Good luck with the last week! I love how it looks Brittany! 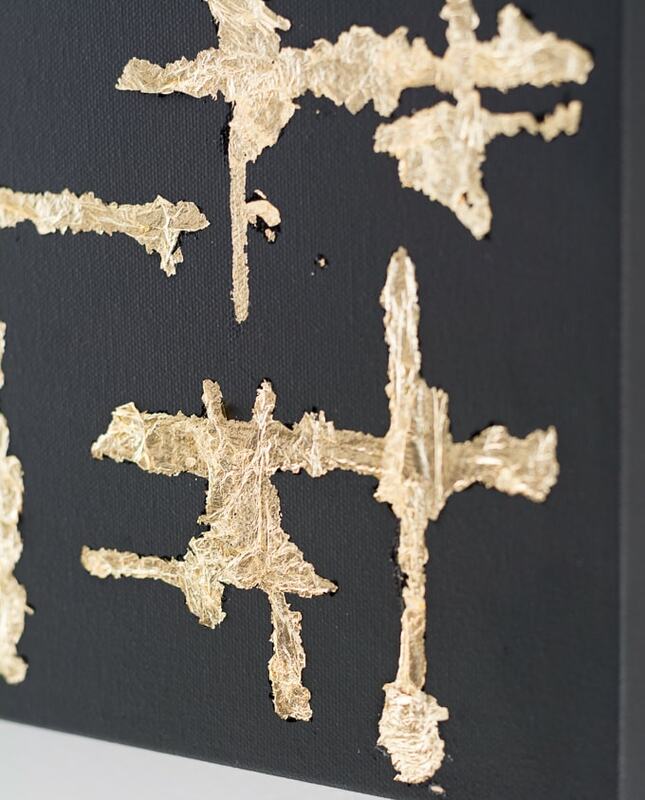 That gold leaf abstract art is amazing! I love how light and bright it is! I think I will be doing my home office for the next ORC, let’s just say it needs a LOT of work! Love the black and gold! And that chair looks so comfy. Can’t wait to see the final reveal! 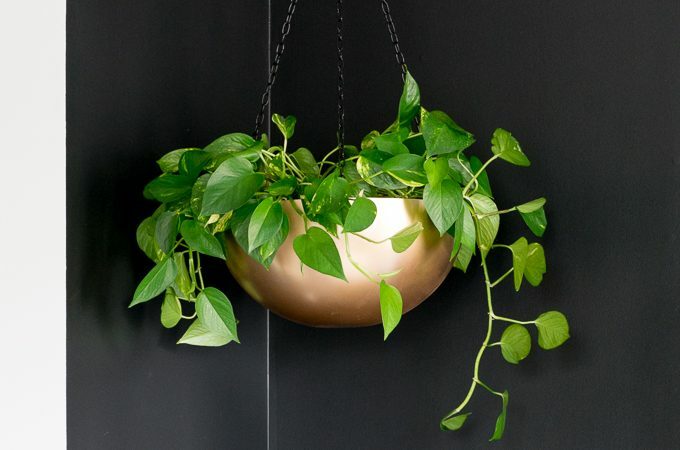 Love the art piece on the wall, the beige & black colors blend nicely with the green plants. 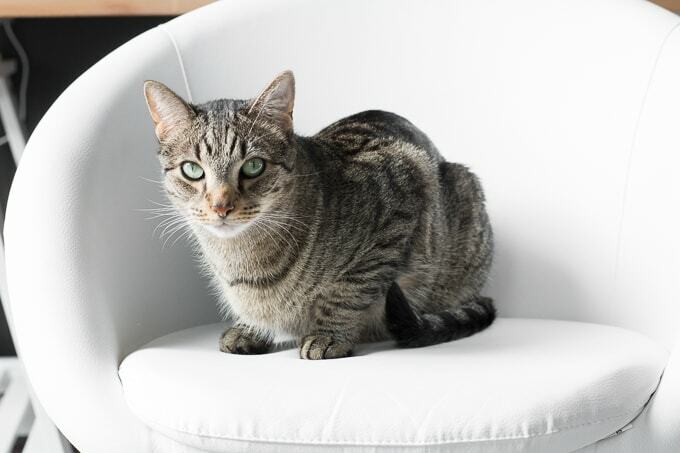 Love your new desk chair, so cute!